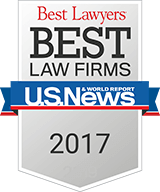 Testimonials | Law Offices of Louis Grandelli, P.C. I was involved in a car accident and broke my arm in several places requiring surgery. At first, I retained one of those law firms that advertises on TV all the time, but became unhappy when they were advising me to settle my case for very little. 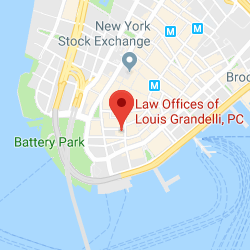 I hired the Law Offices of Louis Grandelli, P.C. to take over my case and he reviewed the file and discovered that the proper parties hadn’t been sued so he immediately sued the responsible parties, and settled my case a short time later for hundreds of thousands more than my first lawyers advised me to take. I was only 26 years old when I was badly injured at a construction site after an explosion. There were many lawyers trying to get my case, but after looking at the firms, I decided to go with Law Offices of Louis Grandelli, P.C. 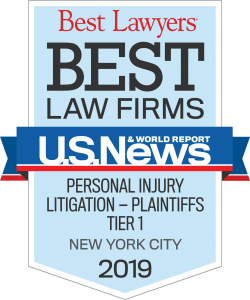 Even though there were many companies responsible for my accident that needed to be sued, the case went through the litigation process pretty quickly and in only 3 years Law Offices of Louis Grandelli, P.C. obtained a settlement where I will receive over $20 million tax free over the course of my lifetime. I was at a construction site when my boss instructed me to head to a lower floor to get tools, but the only way for me to get down was to use a stairwell which was slippery and dangerous. I needed surgery to my back and knees, but the defendants blamed me for the entire accident, and wouldn’t offer me any money. Louis Grandelli fought hard for me and was able to recover money which provided comfort to me and my family for the rest of our lives. I was working on the rebuilding of a bridge when a contractor left a pile of concrete in my work area causing me to trip and break my ankle. The insurance company fought me on everything, but Louis Grandelli was there for me the entire time and was able to prove that the defendants were completely at fault for my accident, resulting in a settlement that was more than I ever imagined. I was in great shape until I fell down a ramp at a construction project and seriously injured my back. I retained the Law Offices of Louis Grandelli, P.C., and he and his entire staff, treated me like family through this difficult process. They resolved my case for a large sum of money and I would never think of recommending any other lawyer than the Law Offices of Louis Grandelli, P.C. I was carrying a piece of stone at a development project when I slipped on gravel which should have been removed by the general contractor. I needed surgery on my knee and the general contractor argued that I could return to work, but Louis Grandelli fought to prove that I could never return to manual labor and receive the type of salary and benefits my family needed. His tireless efforts resulted in a recovery of over $1 million tax free. As I was walking home from work, I tripped on an un-leveled sidewalk causing me to fall and break my arm. We knew many lawyers, but the Law Offices of Louis Grandelli, P.C. came highly recommended and the reasons soon became obvious. They retained qualified experts to prove that the defendants were negligent and that I couldn’t return to work. They settled my case for far more than I ever dreamed was possible. 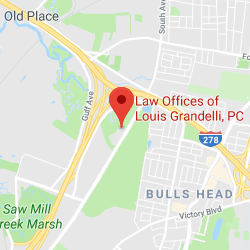 I’ve been a criminal lawyer for 20 years and know dozens of Personal Injury attorneys, but there’s no one that I would refer my cases to other than Louis Grandelli. All of the clients I’ve referred to the firm have been extremely satisfied, and when I call to ask about the status of the case, they are always on top of things and inform me on the progress of the case. I had a very difficult case and used Louis Grandelli’s law firm because I’ve heard they achieved many remarkable results. They treated me like family, always returned my calls promptly, and in the end, were able to achieve a result that greatly surpassed my expectations.